All the paws up in the air! … And again I’m curiously looking for new adventures in my hometown Leogang, located in the very heart of the Pinzgau region. By the way, I haven’t introduced myself – I’m Sissi, the hotel’s dog – a purebred Beagle. First, I really love eating, which makes my body rather curvy. And therefore I cannot participate in Germany’s Next Dog Top Model – GNDTM! Second, I have a really big heart for all the little guests that come to my hotel. In winter I love to go tobogganing or for a walk with them. 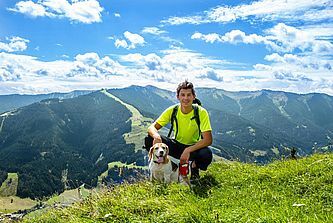 In summer, almost every day, I’m in the mountains with our active tour guide Philipp and our guests and join them in their hiking tours. During the breaks, I enjoy eating the guest’s lunch (it’s actually sooooooo tasty!). Thank god they are never mad at me because I’m the secret star of the hotel. Of course, in our hotel my fellow four-footed friends are more than welcome! when they have lunch or dinner. While mummy and daddy relax in the SPA area, we have to stay in our hotel room. I would really love to welcome you here in our hotel! Please let us know that you bring your dog, when booking a room. Woof, woof – see you soon! 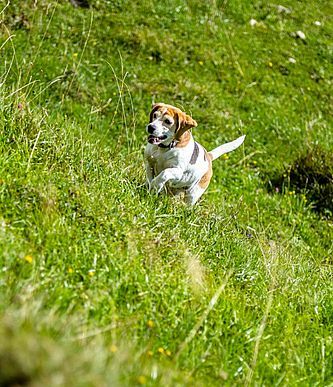 In Leogang and Saalfelden dogs must be kept on a leash. It is recommended to carry a small plastic bag to clear away your dog’s dirt. “Doggybag” stations are available in town.